Simon Fraser University works with German Olympics media partner medienfabrik to produce and print daily Olympics newsletters overnight. 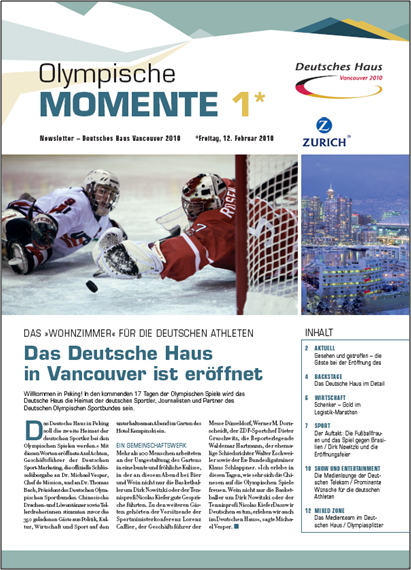 Award-winning Web-to-Print solution, WebCRD™ and customer Simon Fraser University are making it possible for readers in Olympic Village locations to receive daily German Olympic news coverage via a newsletter called “Olympische Momente” (Olympic Moments) printed by the on-campus print operation. 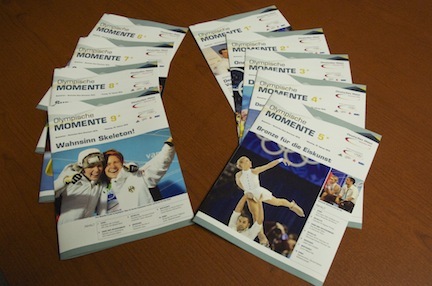 The 2010 Olympics Committee has entrusted Simon Fraser University (SFU) Document Solutions with the time-critical task of communicating the daily events via a German language 12-page A4 daily colour newsletter. Working with German Olympics media partnermedienfabrik Gütersloh GmbH to create and print the daily German colour newsletter overnight, the department packages the newsletters at 6 A.M. for distribution to Olympic locations each morning by 9 A.M. The 16-issue newsletter contains articles on the events and progress of the German Olympics team in the Vancouver 2010 Olympics. Photos and other materials are sent each evening to Germany by reporters based at the games for final assembly and approval by Olympics media partner medienfabrik. At 1 A.M., the resulting digital pages are submitted to the SFU Document Solutions Web-to-print Submission System, WebCRD, via the internet, reviewed, and then produced using a Xerox iGen digital colour press by SFU staff. At 6 A.M., the newsletters are packaged and ready for delivery to German House at Harbour Centre in downtown Vancouver and at Whistler. During the games, Harbour Centre’s main floor has become German House, a centre for visiting German dignitaries, media and athletes. About seven months ago, Nadrajan and his staff demonstrated the WebCRD software to medienfabrik, a leading German corporate publishing agency who is handling German Olympic coverage. They quickly tested files, and were ready to start using the system in about 15 minutes. SFU’s Document Solutions staff is sold on the ease of getting the files for print imposition and production, and how much easier it has made this process. “I was concerned that if we failed, it was Simon Fraser’s reputation that was on the line, but it’s working very well. medienfabrik has complimented us and have been very impressed with the quality." WebCRD and additional workflow solutions are available through RSA’s partners and directly from RSA. Founded in 1986, Rochester Software Associates, Inc. (RSA) delivers Integrated Workflow Results. RSA’s Enterprise Workflow Solutions provide print centers with software to transform legacy data center data streams, manage enterprise print workflow, and provide digital web-to-print. Top enterprise print operations rely on RSA solutions to increase operating efficiency and increase print volume without increasing staff. RSA enables Internet-based print job submission and fulfillment (WebCRD, BatesPrint, and CDPrint), enterprise print workflow management (QDirect), printer productivity enhancements (EPSPro), and print transform (M.I.S. Print, IPDSPrint, RDOPrint, and VIPrint). For more information, visit http://www.rocsoft.com. ©2010 Rochester Software Associates, Inc. AutoFlow, AutoStock, BatesPrint, CDPrint, CentralPDF, Enterprise Workflow System, EPSPro, IPDSPrint, Make Ready Integration for QDirect, Mainframe Downloader, M.I.S. Print, More Than a Storefront, PDF Pro, QDirect, QDirect.EDU, QDirect.SCAN, RDOPrint, Scan to Print Center, SurePDF, VIPrint and WebCRD are trademarks of RSA. JobReady is a trademark of Adobe.